Random House Books for Young Readers, 9780399554483, 32pp. The same team that brought you Where Do Diggers Sleep at Night? and Where Do Steam Trains Sleep at Night? have created another high-flying bedtime story—this one for plane enthusiasts! 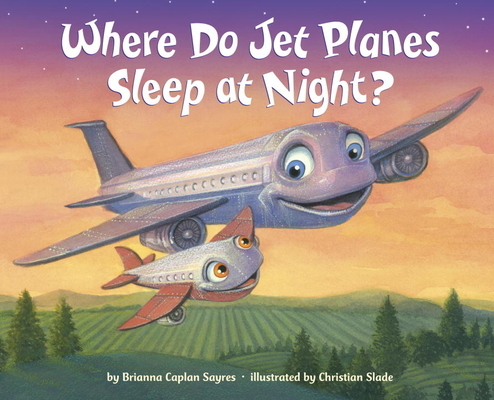 BRIANNA CAPLAN SAYRES is also the author of Where Do Diggers Sleep at Night? and Where Do Steam Trains Sleep at Night?, both illustrated by Christian Slade. She lives with her husband and their two boys in Seattle. You can visit Brianna on the Web at briannacaplansayres.com and facebook.com/authorbrianna. CHRISTIAN SLADE’s classic, distinctive art style can be found in picture books, novels, and magazines for children. He holds an MA in illustration from Syracuse University, as well as a BFA in drawing and animation from the University of Central Florida. He lives with his wife and two children in Florida. Visit him on the Web at christianslade.com. Praise for Where Do Diggers Sleep at Night?